I'm using Firefox Quantum 60.4.0esr (64-bit) on my CentOS 7 Linux system with KDE 4.9 desktop environment. From time to time I'm no more able to scroll the Firefox window with the mouse wheel. I need to change the focus to another window and come back to Firefox to reactivate a proper scrolling, or just minimize and reopen the Firefox window. A systematic malfunction can also be reproduced as follow: while scrolling is working in Firefox, open another generic application window and then close it so coming back with focus on the Firefox window; scrolling no more works also after clicking on the Firefox window. How do i make deepspeech voice engine work on firefox? How do i make it work on firefox? 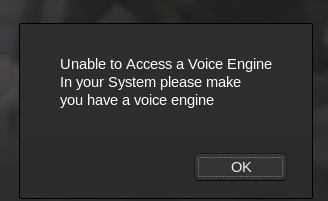 Can't use any tts extension since it outputs missing voice engine (https://i.imgur.com/7FzHs1V.png ) or doesn't work. how do you search the mozilla site? i want info on browser-based FTP options. When I inspect particular web page element.Please assist me. I have never had a message like this. It appeared out of the blue, and outside any open window. Shortly thereafter there was an un-asked resetting of (I can't really remember) my email server. So I'm apprehensive of some sort of hacking. Working on hardening a Linux Distro. The idea is to let users run only Firefox and just use it for browsing. All file system access (even browse) for the users should be restricted. Managed to restrict file system access every possible manner. But Firefox's file picker is giving it away while accessing websites which ask to upload files or attachments (ex: email). Looking for a way to disable filepicker or any other idea to overcome the situation. Thanks in advance for any ideas or suggestions. I have the information in the back of my mind that Firefox had some sort of limit on how many bookmarks one could save? AFAIK it deleted these afterwards, so the performance of the autocompletion (in the address bar/omnibar) would stay reasonable. IIRC there was some similar (but lower?) limit for the Firefox history, but if that is deleted I obviously hardly care. The reason is I'd like to check how near I am this limit. After I found [one way](https://superuser.com/q/1194424/522670) or actually [two ways of counting all bookmarks in Firefox](https://superuser.com/a/1255995/522670). Also: **What happens if I exceed this limit? ** Is there some sort of warning? Does Firefox just delete old bookmarks? So, do i have to fear Firefox could delete some bookmarks, if I use them too excessively? Also asked/cross-posted at [Stackexchange Superuser](https://superuser.com/q/1425094/522670). how to split the broswer to display to different webpages at a single time? i want to access to webpage at a single time side by side . is there any plugin to do so or any setting or shortcut to do ? I'm using FF66.0.2 and this has been working properly before. I can see that the default was changed in release notes, but the documentation still states that one can set this. Why doesn't it work? I've tried this in safe mode as well. No change. Obviously written for an older version of firefox. I am unable to add a site to exception list unless I visit it. However, when I visit those urls there are no options because it is not trying to set anything. How do I just add the urls to the exception list? I would like to know how firefox implements location check/test in order to determine that Yandex mus be a default search engine in Russia. I can take a screenshot and I will see it in screenshots but when I click on the icon to see all of my other screenshots it seems to be stuck on a loading screen and never opens. Also the heart icon that was there so I can save shots indefinitely disappeared weeks ago and I'd like to get it back. Firefox is running out of disk space. On my Linux workstation running version firefox 66.01 it displayed the message "Firefox us running out of disk space. Websites contents may not display properly. Visit "Learn More" to optimize your disk usage for better browsing experience. The disk space on my Linux is ample with more than 20 Gig free. can anyone explain the message? FF 66 adobe flash player not working ? Adobe flash player not working for me in both w10-64bit and Linux-64bit ff 66.0.2 versions. I do not recall the last ff version that flash worked in. Have the latest flash 32.0.0.156. for both. My Linux Chromium and w10 explorer play flash player applets just fine. The sandbox solution dom.ipc.plugins.sandbox-level.flash does not work any more, because there is no such thing in about:config in ff 66. Also tried to disable protected mode in about:config, and still won't start the flash player.